Memorial services will be Tuesday, October 16 at First Baptist Church Lakeside at 10 A.M.
Interment will be at Evergreen Cemetery in Lipan, Texas at 2 P.M. following service. Raymond was born on Fort Worth on February 28, 1937 to Hattie Pearl and Raymond Beck Sr. He graduated from Lake Worth High School where he enjoyed playing football, drafting, and making life long friends. They continued to me monthly until his passing. Raymond went to work for NCR (National Cash Register) in 1960 as a Field Engineer. He had a 41 year career with NCR before retiring. He met his beautiful and loving wife at a dance in Fort Worth at the YWCA. They married in 1962. Raymond proudly served his country in the US Army Reserves. Raymond served on the Lakeside City Council and later served as Mayor of Lakeside for over 20 years. He was always a man of integrity and cared for the citizens of Lakeside. It was not uncommon for him to take calls all hours of the day. Spots or Red, as he was called by his high school friends, made a Senior trip to Colorado that became a tradition for 52 years. He loved the outdoors! Hunting, boating, fishing, motorcycle riding, and 4 wheeling were done with friends and family. He was a friend to everyone and all the neighborhood kids looked up to him. Raymond was always fixing something for someone: bicycles, cars, broken toys. You name it, he fixed it. Raymond loved his family dearly and helped to build homes for his mom, his wife and kids, his in-laws, and later a weekend cabin for his daughter. 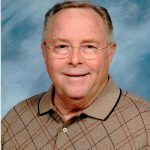 He always made time for his children and we all have fond memories of water balloon fights, camping, basketball, ping pong, water skiing, sledding, and football watching. Once retired and the grandkids came along, he enjoyed taking them for rides on his 4 wheeler, playing dominoes and even babysitting! Raymond is survived by the love of his life of 55 years, Dolores, daughter Cindy, daughter Sherrie and son-in-law Roger, and son Kenneth. Grandkids Hunter, Colten, Eric,, Carson and Emma. Be the first to share a memory of Spots or Red.